The Ham from Ham Project was launched to produce the finest Gloucestershire ham to serve at the Sally. Our ‘Ham’ ham egg and chips and ‘Ham’ ham rolls were already legendary but we knew we could do better. We wanted the ham we used to be more local. We wanted to know which pigs produced it. We wanted the flavours to reflect the environment in which the animals lived. We wanted to resurrect traditions once integral to the identity of the Berkeley area. We wanted to make ‘ham from Ham’. In early May 2014, eleven piglets, five Gloucestershire Old Spots and six Old Spot/Tamworth crosses, arrived in Ham and were introduced to their new home, a wild-wooded 19th century walled garden just a short stroll from the pub. Happily roaming and foraging in half an acre of woodland, the Sally pigs were given the most natural pig environment we could possibly provide. Old Spots are our favoured breed due to the quality of the meat and because they originated in the Berkeley area. The ‘Spots’ were traditionally fed whey from local farms and fruit from the surrounding cider and perry orchards in the Vale. It was the flavours imparted from these that gave the Old Spots its famously delicious meat. Sticking to these traditions, the Sally pigs have been fed whey from our local cheesemaker, Godsell’s of Leonard Stanley, apples from the Berkeley Estate orchards and pulp from local cider makers. 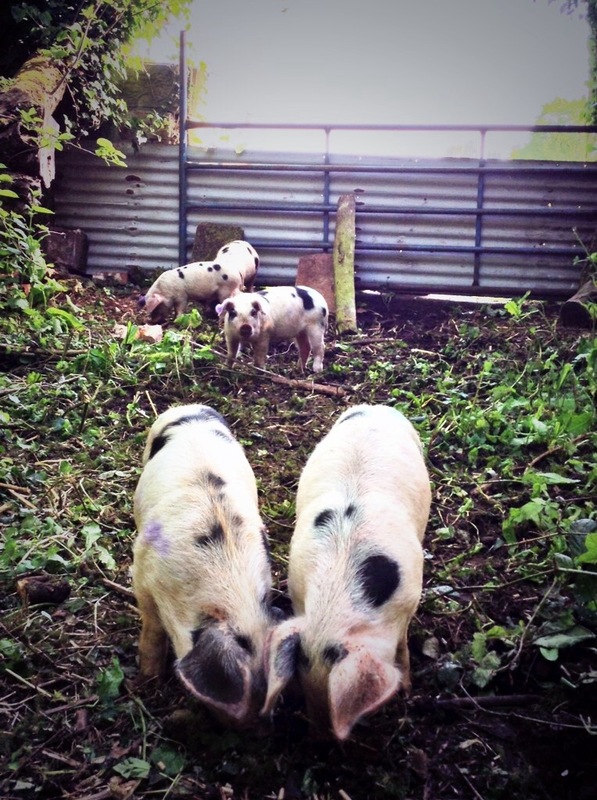 Our first two pigs left the walled garden at 11am on Monday 20th October 2014. By 7.30pm that night, we had served the first plate of food from them; faggots and mash. At just under ten hours from field to fork and 100 yards from gate to plate we think these faggots must have been one of the freshest, most local dishes ever to be served from a pub kitchen. A week later we received the rest of the meat jointed by our Guest Chefs, Polly and Craig. Giving it the ‘Whole Hog’ treatment, all parts of the pigs were used – chops, belly, loin, tenderloin, ribs, trotters, hocks, heads and hams. Every bit as good as we had hoped for the meat was just mouthwatering – certainly fattier than commercial breeds but deep in colour and full in flavour. Four weeks later, Polly and Craig had finished curing the first of our hams and served up the “Ultimate Ham, Egg and Chips”. Three slices of ham; one wet-cured, one cider-cured and one glazed in garlic-mustard and hot-smoked. Each was equally delicious – the Ham from Ham Project was a success. The meat from the Sally pigs is available from now on so watch out for it on our lunchtime menus and Guest Chef evenings and please do let us know what you think. In the meantime we’re going to keep experimenting with curing, smoking and cooking methods so that our hams just keep getting better and better. Come the spring, it’ll be time to replenish the walled garden with a new litter of weaners so the Ham from Ham Project can start all over again. We really can’t wait!